How many Maldivians does it take to find a night dive site? Since November is our 10 year wedding anniversary Troy and I decided to treat ourselves to something nice for a change. After all we have done zilch, gone nowhere and experienced nothing in the past 2 years. Oh wait, that was a previous life! Anyway... for our anniversary we went to the Maldives for a week of diving on a liveaboard boat. For those geography freaks and people that like meaningless facts floating around their head, the Maldives is an island nation made up of 26 atolls located off the southwest tip of India. It is directly west of Sri Lanka. 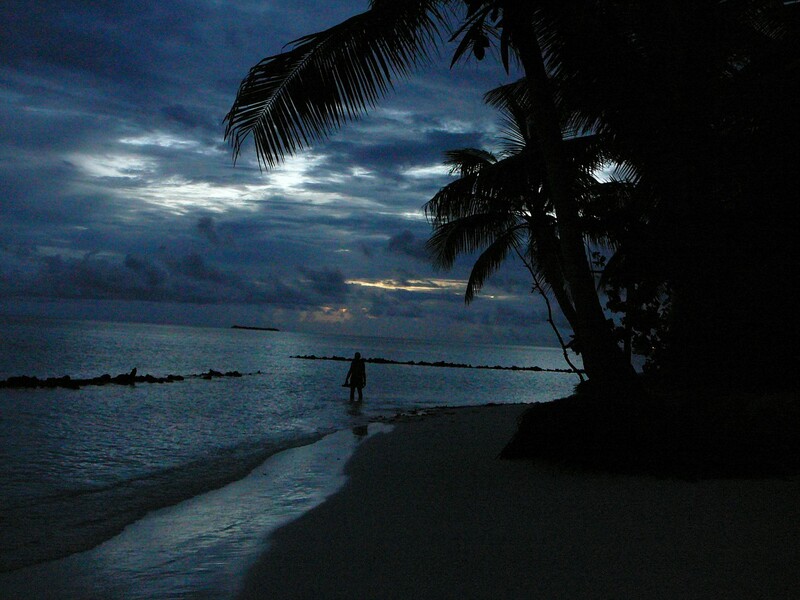 An atoll is a ring shaped coral reef or a string of closely spaced coral islands enclosing a shallow lagoon. The Maldives is an absolutely beautiful place. It holds the world record for being the flattest place on earth with the highest elevation of 10'. We have read several articles that have said if global warming keeps at it's current rate, all of Maldives will be under water in 10 years. I guess it's a good thing we got there when we did. The islands of the Maldives are tiny, tiny, tiny. It is one of those places where there is not much to do but dive, sleep, spa, snorkel, walk around a tiny island in 7 minutes and drink (of course). There is no hiking, renting a car and exploring the island or going to the local market for shopping. So being on a liveaboard was the best way to experience the place because we were not stuck on one tiny island the whole time. Troy and I both agreed this is probably some of the best diving we have ever done. Since there are strict fishing regulations and most of the area is a marine protected environment, there were just tons of fish on most of our dives. There were some dives that we would be right on the edge of a huge school that consisted of thousands and thousands of 4-7" long fish. Something would spook them and they would suddenly swim left then right then left again and it was like "ZOOM, ZOOM, ZOOM!!!!!" You could feel and even hear the sudden rush of their movements. It left you thinking "What the hell was that?" It was quite freaky and is one of those things that can't be described very well. Our last diving trip to Myanmar was our first experience with Manta Rays. We were so excited to see 2 Mantas is 30' visibility of water. But the Maldives proved to be better then that. One day our boat was in an area where we were surrounded by them. Troy, me and another guy jumped in our dinghy (a dinghy is a small boat, not a ditzy girl) and had a crew member take us to where there were 10 Mantas slowly circling on the surface. 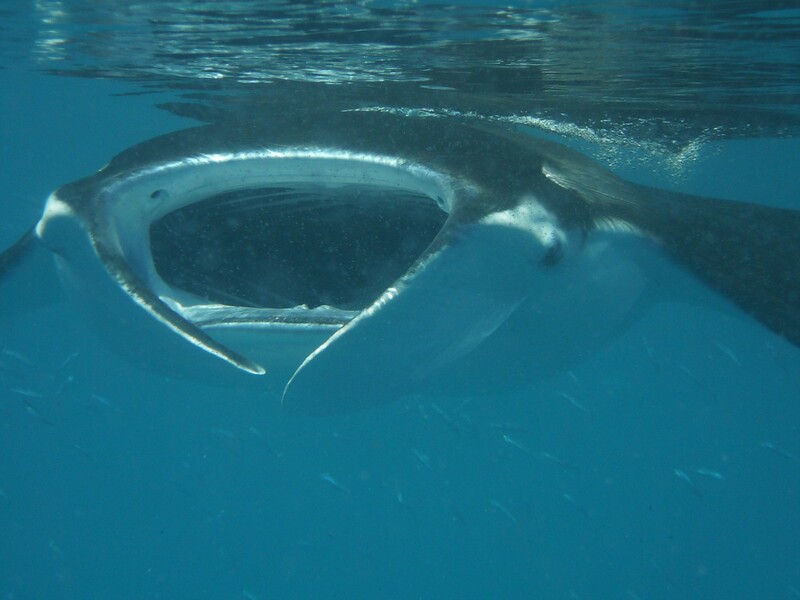 We snorkeled with them for about 20 minutes before the Manta's took off. This was very exciting because they were right on the surface so the visibility was amazing. Because we were snorkeling instead of diving Troy could actually growl at me me to "Stop touching them!" instead of making menacing sounds through his regulator while diving. 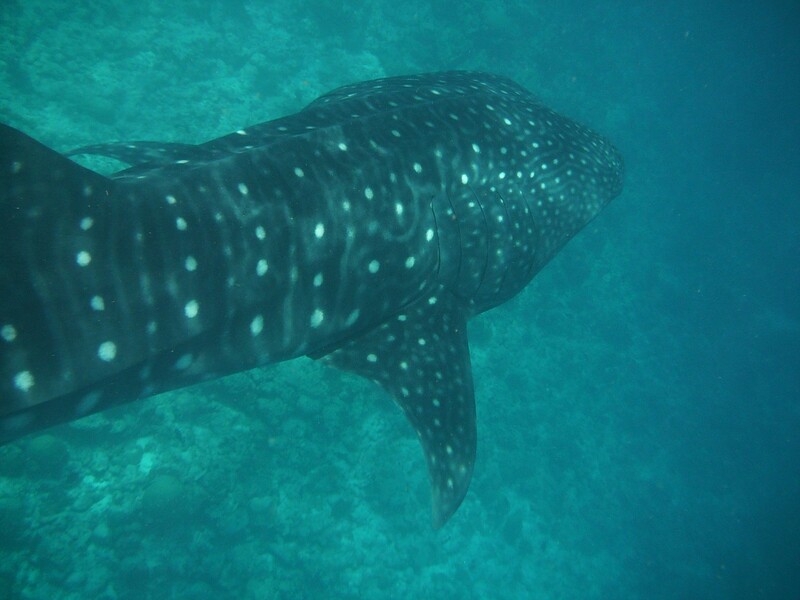 We also finally saw whale sharks as well! We actually took these photos as opposed to past blogs where we used someone else's pictures. Whale sharks are the largest fish in the ocean (whales are mammals) and can measure over 30' in length and weigh several tons. They feed on plankton so they are completely harmless to people. As we're heading to a dive site our guide saw one a short distance from the boat. We all scrambled for our fins and snorkels and jumped in. We were able to snorkel with it for about a minute or two before it dropped to deeper water. An Italian guy in our group didn't see it and me, being the polite person I am, said (actually yelled) "You didn't see it? How did you not see it? It was right there!" (I'm such a kind person.) We came across another whale shark a few days later and the Italian saw it so lucky for him I didn't have to yell at him again. About the only disappointing thing on this trip was we were only allowed to do 3 dives a day. 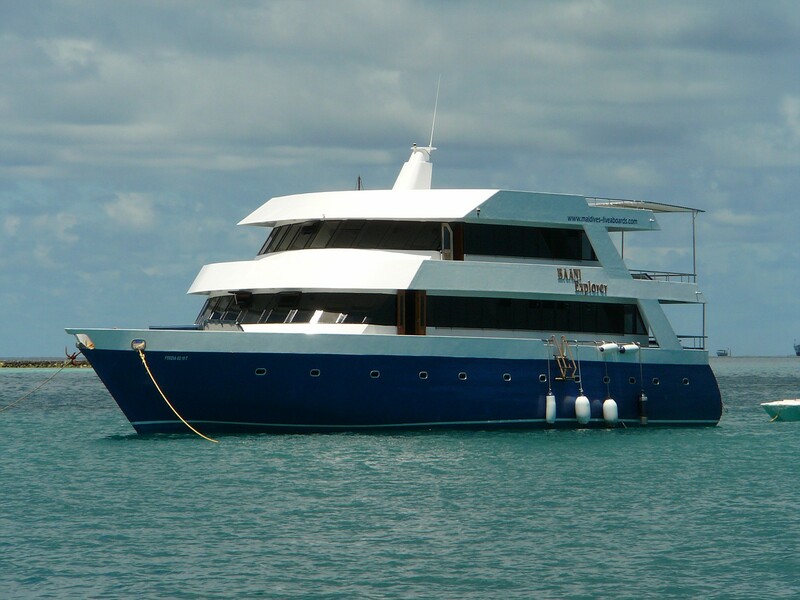 For most liveaboards, divers have the option of doing up to 5 dives a day. We thought it was a regulation but we quickly found out that it is just the choice the dive boats make. So needless to say, we had a lot of downtime on the boat. Because we could only do 3 dives we were given the option of only one night dive. Even though it was just one night dive, it was by far the best night dive we have ever done and actually had our adrenaline cranked up a few notches. But before it could get good, it had to be frustrating first. Meaning that our dive guides couldn't find the dive sight. It's pitch black, way past sunset and after searching for 20 minutes for the dive site, our guides realize the batteries in the GPS are dead. So they proceeded to search for the reef with a flashlight. It's kind of like searching for a needle in a haystack... at night! We finally found the sight and was very excited to see all the animals were out feeding. 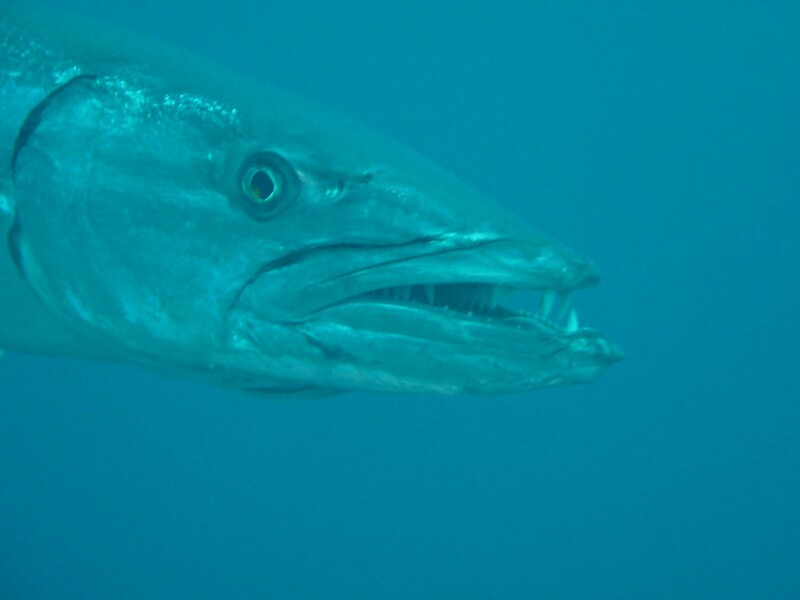 Sharks, eels and the biggest Barracuda we have ever seen. They normally measure about 2-3', but this one was about 6'. Fellow divers, I know you think I'm lying but I swear he was huge!!! Baracuda's are scary enough as it is, but to do a night dive with a 6' mother is something else. 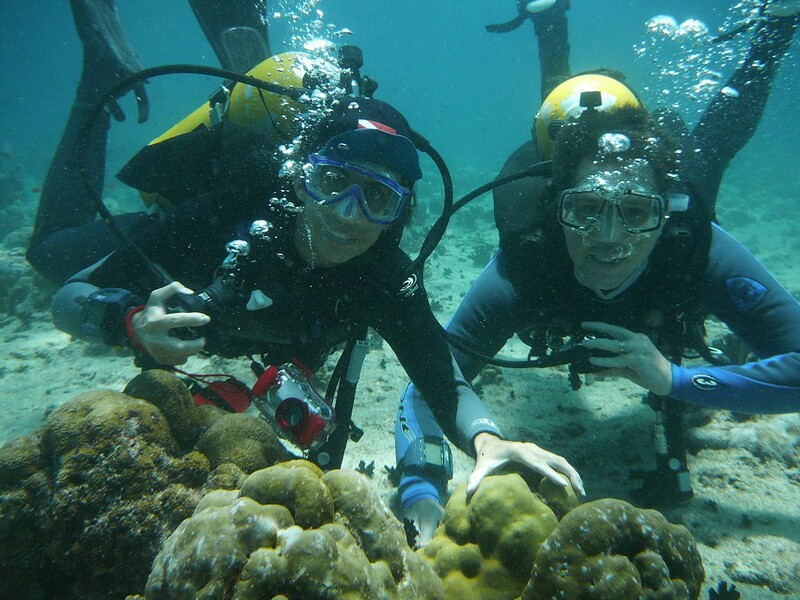 Troy and I came across an area in the coral wall where 3 eels were feeding. Normally they are tucked away and all you see is their head. These guys were out swimming around and trying to grab fish. We have never seen anything like this so we hung out to watch how they feed as well as watching the occasional reef shark swim by. As we're watching, one eel lightning quick grabbed a fish but was not able to get the whole thing in his mouth so there is this mangled fish just hanging out. All of a sudden here comes this shark, excited by the smell of blood. He starts swimming these frantic circles around us and the dead fish trying to find the source of blood. I refused to leave Troy's side and had a death grip on his arm. In the meantime there goes the 6' Barracuda wondering what all the commotion is about. We were both a little freaked out, not knowing what was going to be coming at us from which angle. The Maldives is mainly Muslim and while we were there it was during Ramadan which is a time for the Muslims to concentrate on their faith and to fast for a month. A few nights Troy and I slept on the top deck of the boat for a few reasons: the lounge cushions were more comfortable then our bed, the constant noise of the boat generator was annoying and the Maldives have about a gajillion stars whereas Hong Kong has six! It was very nice and relaxing until 4am came and we could hear the call to prayer that was being blasted from a speaker on a nearby island. Maldives is a popular diving location and because of the crystal clear waters and abundance of marine life.